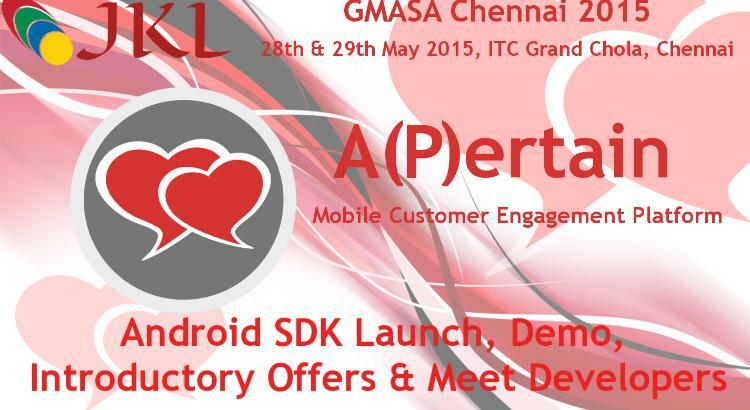 We at JKL Technologies are proud to invite you to the GMASA Chennai 2015 to participate and know more about of A(P)ertain – A Mobilel Customer Engagement Platform, a pluggable SDK for Mobile App/Game Developers. The event is held on ITC Grand Chola, Chennai on May 28th & 29th of 2015. We are there from morning till evening with the Developers who developed the SDK. Please visit and have a sneak preview of the SDK and an introductory offer on A(P)ertain Publisher Accounts. We will be honored with your visit!